Soul and authenticity can be lost in this era of modernity, 21 year old artist Sky Renee brings spirit back to music. Inspired by the 70s, her music contains insightful yet simple lyricism combined with funky undertones and rhythm that will both make you dance and spark your mind. As a Health promotion major at USC and Pre-Med, Sky has a perspective that has developed from understanding the world in its greater form, her introspectiveness adds a unique quality to her music and presence. Yet, she still has a vibrant and bubbly personality that shines through her body of work. She possesses the ability to let go and have fun on stage and in her songs, while still maintaining a thoughtful outlook on life. Additionally the relatability of her character and her positive demeanor allows her to connect with her fans on a lasting level. 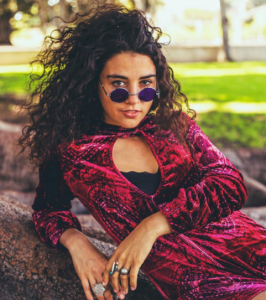 With the help of industry veteran vocal coach, Ron Anderson and Grammy award winning producers such as Greg Penny and duo Robert “Storm” Daniels and Eric Jackson, Sky has been working towards something. Her first single “Good as Gone”, a catchy pop-soul tune, received heaps of praise and up to 300,000 streams. The music video for the song received over 1,300,000 views on YouTube and caused her to grow a steady fan base. After working on personal growth and sound development, Sky is back and has mastered crafting her voice and sound to create something truly remarkable. “In my Life” offers a chance at understanding the change in perspective as Sky has grown into a more aware and comprehensive individual. Searching for something new, she finds a deeper awareness within her own self. Thanks so much for your time! Where does this interview find you today? Is there music playing in the background? If so, what is it? What music instantly lifts your spirits? Hi! Of course, my pleasure. I’m currently sitting at my studio in my apartment, letting my ears take a break after producing a demo, so not listening to anything at the moment. I was listening to Steve Lacy’s Demo – EP before though on repeat. I love groovy music, with funk influences. That gets me moving. However if I’m ever in a bad mood I can always rely on The Eagles to cheer me up. It seems like at every big shift in my life I always find a new song of theirs that I can relate to. My current song of theirs is “Life in the Fast Lane” but another song I’ve been really digging recently is “Wish I knew You” by The Revivalists. From what I’m told, I was obsessed with music from a very young age. My parents say that the only thing that could calm down me down when I was a baby was the musical Cats, which has one of the best soundtracks of all time. I’m the oldest in an extended family and we are all extremely close. I remember during holidays and gatherings I would put on a show where I would sing for my grandparents, aunts and uncles. My grandma is still probably my biggest fan. So now that the year is almost over, what are some of your thoughts about 2017? What are you excited about for 2018? Will you make any New Years Resolutions? 2017 was an insane year, I graduated college, I played my debut show and sold out The Troubadour — and started to truly find my voice as a musician and a community to share it with. I’m ending this year with a stronger understanding of my artistry and more time on my hands to work passionately on creating new music. I’m really looking forward to 2018. I’m big on resolutions and starting fresh with a new year, so I’m looking forward to reflect and start anew with positive intentions and goals for the upcoming year. My hometown is Malibu, easily one of the most beautiful places in the world. I think being surrounded by that kind of nature made me see the beauty in the world. Additionally, it was an environment that was very conducive towards being an artist. Most of my friend’s parents were in the entertainment industry so the idea of being a musician or an actress didn’t seem so far-fetched as a dream. Everyone in the community is incredibly supportive towards pursuing something creative and have been incredibly supportive with my music. That being said, growing up there wasn’t always that easy. I moved from Montreal and since it’s a tight knit community, it took me a while to fit in. Also, the only way to get around is driving on PCH and I didn’t get my license until I was a senior in High School (I skipped 2 grades). So I spent a lot of time at home, dreaming and writing. What was it like making your first ever music video for “Good As Gone”? Did anything surprise you about the process? How do you think this song is different or similar to anything else you have released? It was so fun! Honestly I think the most surprising thing was how comfortable I was with the whole process. I feel really at peace when I perform and everyone on set was a joy to work with. I love music videos because you get to interact with so many different types of people and it’s a cool crossover between music and cinema personalities. I think that “Good as Gone” comes from a really genuine place like most of my songs do and has an empowering message to deliver. The song itself is a little more Hip-Hop then what I’m doing now, but it is still one of my favorites. Why do you think Hazan Records is the right place for you and your music today? Why is it a good fit for you? Hazan Records has supported me throughout this entire process. I am very thankful to have a label behind me that is willing to support my artistry and truly believes in who I am. 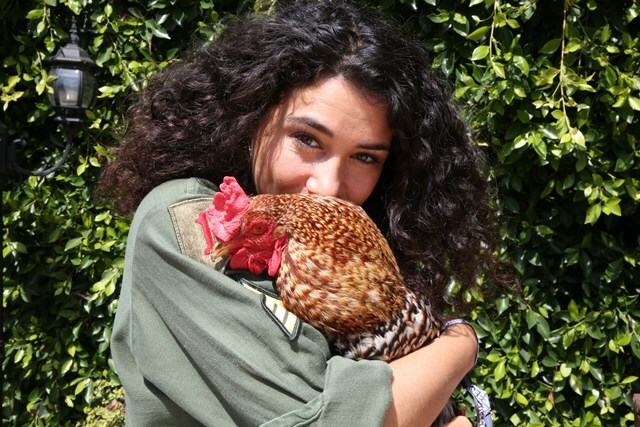 Since our main All Access office is located in Malibu, I have to ask you about your pet chicken named Malibu! How did you come to have a pet chicken and why did you name him Malibu? The chicken story is a funny one! He is also a rooster. I always wanted a pet. One day my mom surprised me with Malibu (the rooster). It was originally our neighbors, but they had to get rid of it. I was younger at the time and kind of became obsessed with him. I named him Malibu, after my hometown. We ended up getting more chickens. Every morning, Malibu would wake me up and I would get the eggs and visit him. Of all of them, he is my favorite. He’s the only one that lets me pick him up and he hangs out with me. He’s a really fun pet to have. With all the chaos going on in the world, I am so thankful I have music to lean on and to be able to express myself through it. Music is truly one of the most beautiful aspects of life and every day I try to remind myself how lucky I am to be able to make music. Music is a universal language and harnesses the capability to spread messages to people instantaneously. I think that it is the job of musicians now to reflect on the times and use the gift of music to spread messages of positivity in an effort to heal the world. I know my goal as a musician is to create music that allows for empathy, rooted with deeper meanings to help people understand one another and create some peace. I relate to the music of the 70s and think similarly to that time period. Future music will reflect on the negative in a positive light, at least that’s what I hope for. This is a really difficult question for me because I find that I’m constantly inspired by new music and new genres. I’ll go through waves of listening to different types of music. Like I was saying I love the 70s, so I find inspiration in artists such as Earth Wind and Fire, The Eagles, The Beatles, Chaka Khan and Prince. Recent artists I look up to are Jhene Aiko and Kehlani. I think they are both so real and their skill is something I truly admire. Grimes is an artist I have followed for a while and everything about her inspires me – she is so dedicated and true to herself. As a female artist especially, people constantly tell you who to be and I think it’s amazing that she knows who she is and doesn’t care what people say. I really love that she does everything herself and I can relate to her. It’s so cool to see her career take off. I’m also a big Calvin Harris fan – his first album “I Created Disco” is one of my favorites. I like that he is returning to those funky vibes. I also think Tom Misch is one of the most talented producers of our time. His music is amazing. I have also recently been very inspired by an artist named Zak Abel that I found through him who is absolutely incredible. If I could work with anyone I listed above I would be extremely stoked. I could honestly go on and on about how many amazing musicians there are and how many I would love to work with. What message do you hope your music sends to listeners? What do you hope they can take away from your songs? I hope that fans take away a positive message from my music. I try and influence deeper thoughts in my lyricism such as self-love, understanding and happiness. I want my listeners to be more aware of the world around them and live with purpose. I hope people can connect to my music and feel like someone understands what they’re going through. My goal is to create music that heals and can help us all act more humanely. What advice would you give to someone that is considering being a musician? Go for it ! If you have that thing deep down inside of you that tells you to follow your dream, you are going to regret it if you don’t. There are so many ways to create and get music out there now it’s totally a feasible reality. Just prepare yourself for rejection and stay determined. Being a musician can be very overwhelming and it takes a strong belief in yourself, but the gift of making music and contributing something creative to the world is worth every difficulty. Also, the second you tell yourself you’re going to be a musician prepare to be obsessed with it. I couldn’t stop even if I wanted to I love it so much. Check out my new single “In my Life” and look forward to some upcoming releases. Also follow me on social media if you’d like and don’t be afraid to reach out, if you relate and wanna chat @skyreneemusic on instagram and twitter.